FOREX IS THE WORLD’S LARGEST AND MOST LIQUID FINANCIAL MARKET, AND MARKET PROFILE IS OUR TOOL TO TRADE IT. Dr. Keppler, a Pioneer in the Development and Application of Forex Profile Strategies, has developed a set of unique and innovative trading strategies to capture lucrative opportunities in the Forex Market. Only a small percentage of Forex traders have discovered the analytical power of the profile. This course demonstrates how Market Profile concepts can easily be applied to Forex trading. Forex traders will have an opportunity to learn how to spot selling and buying tails, key auction levels, points of control, fair market price, market value parameters and areas of underdevelopment. The course presents actual examples of Forex trades using profile concepts and basic technical tools. The ability to identify when prices rise above a value area high or drop below a value area low can provide significant trading opportunities in the Forex market. These important developments are not evident or identifiable on any other type of chart. This course is designed to offer Forex traders an opportunity to understand and learn how to apply the Profile Forex Advantage. 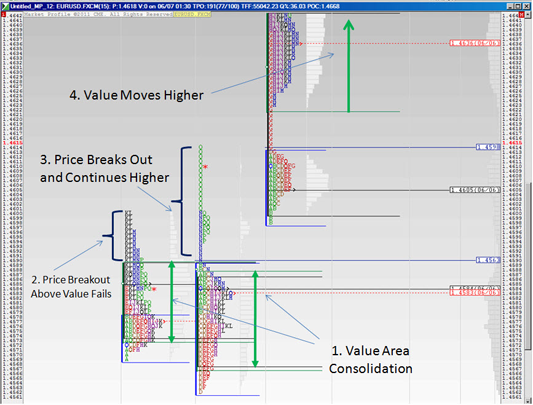 Market Profile Charts and Concepts are a powerful analytical tool that can be applied to any electronically traded market. Market Profile Concepts can be applied to Forex, Stocks, Futures, Commodities and Bonds. They are also suitable for position trading, swing trading as well as day trading. Some traders mistakenly believe that since the Forex spot market is not traded on a central exchange, the Market Profile Concepts can’t be applied to the Forex market. Nothing can be further from the truth. While it is true that there is no central exchange for the Forex market, the profile provides a formidable and invaluable tool for the Forex trader. The profile structure can be developed and analyzed for any currency pair. The conceptual framework of the profile design allows for a comprehensive and basic analysis of the market without numerous technical indicators and complex tools. Once a trader understands and learns to use the profile they discover a new world in the Forex market. They are able to identify and capture many opportunities that are simply not visible on traditional charts. The profile provides an organized structure and a logical basis for understanding and interpreting Forex market developments. In buying or selling any financial instrument, it is extremely helpful for a trader or investor to know and understand where value is in the market relative to the current market price. Market Profile makes it possible for a Forex trader to identify both long term and short term value in the market. Market profile is the only charting technique that can actually identify value in the marketplace for any currency pair. Once a Forex trader discovers the power and benefits of understanding market value they will be amazed that they were ever able to trade without it. The three-dimensional view of market action and the capability of organizing market data in a normal distribution pattern allows investors and traders to gain a tremendous insight into the market. A view that is not possible with conventional charting methods. 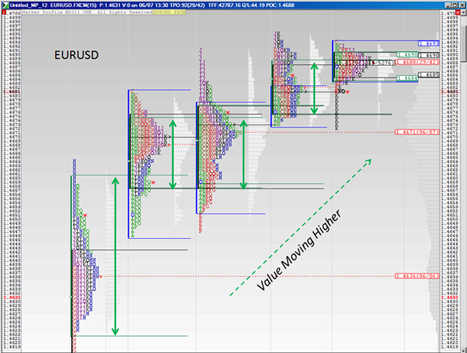 The support and resistance levels on the profile chart are derived based on actual market activity and value parameters. As a result, these support and resistance levels are more easily and reliably identified by a Forex trader. Any currency pair on the Forex spot market is continually moving between a state of balance and imbalance in the market. The profile makes it possible to monitor the balance points for the currency and transitions between balance and imbalance in the market as they occur. The profile’s development and path of movement immediately unveils the existence of a directional trend or a sideways market . Thus making it possible to capture directional moves early in their development. In a trending market, the structure of the profile is narrow and long, while a balanced market is more developed and wider in structure. The course explains the development for the various types of profile structures and the appropriate strategies required to trade them. As a basic principle, Market profile charts move our thinking beyond the focus on price . The profile integrates the “Market Value” concept in its analysis — Forex markets behave just like any other market system, they are governed by the forces of supply and demand. The market for any currency pair alternates between periods of equilibrium and chaos. When prices seek to find a new value area after each trend, the market develop around a fair price. When there is an increase or decrease in buying, prices move out of equilibrium, prices break away from equilibrium and trend higher or lower until a new balance is achieved. The whole process of price action is driven by the laws of supply and demand.This dynamic is clearly visible on the profile chart making it possible to forecast range extensions and potential price targets with remarkable accuracy. 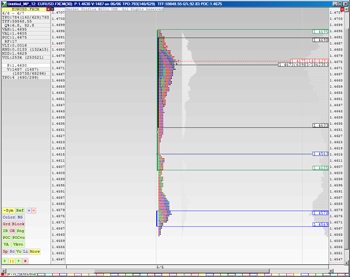 Market Profile Charts Identify Trade Opportunities Not visible on Other Type of Chart. The profile provides a unique visual representation of the market. The profile shape and structure allow traders to identify and spot trading opportunities that are not apparent on any other chart. In this course, Forex traders will have an opportunity to learn how to spot a selling or a buying tail, auction points, points of control, fair price, minus developments and ledges. Moreover, participants will be able to immediately see when prices rise above a value area high or drop below a value area low. These important developments often create rewarding opportunities in the market and are not evident or identifiable on other types of charts. Selecting an appropriate location for a protective stop is often a challenging task for many Forex traders. Frequently, Forex traders are stopped out of a trade only to find the market turn and move in the direction of their trade after they have been stopped out. The profile structure makes it possible for a Forex trader to select and base their protective stops on key structural elements in the profile. This allows the Forex trader to strategically and properly identify protective stop locations for each trade. The appropriate location of a protective stop reduces potential losses and enhances the risk management process for each trade. The profile is simply an innovative and smart way to analyze the Forex market. Unlike traditional technical analysis and charting techniques where only price movements are measured by using technical indicators, the Market Profile theories provide the trader with a wealth of information about the underlying structure and strength of the market. Using the power of the profile, a Forex trader can gain a much greater understanding of market activity and the market forces behind the activity.